The U.S. Department of Education named Saint Agnes School a National Blue Ribbon School for the third time. Saint Agnes School earned this award because of its Exemplary Academic Achievement school wide. 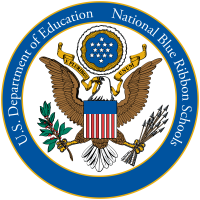 Saint Agnes School was the first elementary school in the Commonwealth of Kentucky to be awarded the National Blue Ribbon Award three times!!! Saint Agnes School first earned the award in 1999, then in 2005 and again in 2014. Way to go, Aggie students!